The quantities of six elements (As, Cd, Cu, Hg, Pb, and Zn) were determined in surface soil from 21 stations around the zinc–lead smelter in Trail, British Columbia, Canada. The flux of elements into a unit of soil was then calculated by extrapolating aerial deposition monitoring data obtained from flat square moss bags, which act as traps for airborne particles/elements. The net increase in the quantity of elements in a 10 cm deep by 1 hectare soil unit over a 3-month time interval was estimated as 0.02, 0.65, 0.07, 0.29, 0.22, and 0.65% for As, Cd, Cu, Hg, Pb, and Zn, respectively. 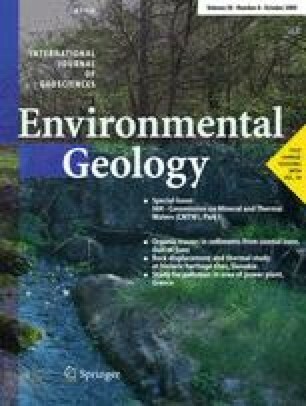 The results of this study can be used for elemental inventory of soil in the Trail area and to predict the long-term degree of accumulation of trace elements in the soil. The significant correlation between the deposition rate of Pb, Zn, Cd, and Cu as registered by moss monitoring stations and the quantity of these elements in surface soil indicate the possible effect of airborne material on the geochemistry of the soils in the study area. In contrast, the poor correlation for Hg and As indicates that the variations of these elements in soil samples are likely related to soil chemistry rather than atmospheric deposition. This demonstrates the importance of monitoring for atmospheric deposition of elements since soil is not always a good indicator of the spatial influence of a point source in the study area.